Moisture falls from the air and collects on the ground, then the air temperature drops enough that the ground moisture freezes. Snow has fallen on the ground but the air temperature remains reasonably cool/cold. However, the snow isn’t cleared from the ground and gets packed down, forming a layer with density resembling ice. Depending on the kind of ice that’s formed and the type of snow blower you have, getting rid of it may be a semi-tough situation or a nearly impossible one. It’s important to understand the basic mechanism of snow blowers. Although each one will vary (either by a bit, if they’re in the same “family”, or by a lot, if you’re crossing categories), each one has paddles (single stage) or augers (dual stage) to clear what’s on the ground beneath it. Electric: The great thing about these is they’re incredibly low maintenance and inexpensive to operate. On the downside, they don’t have a lot of “guts” inside and tend to not be able to perform sturdily in cold, harsh, snowy/icy weather. 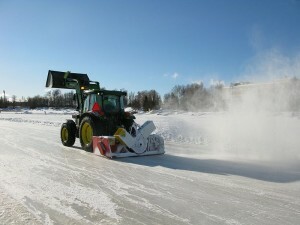 Gas: These are definitely the beasts you want if you have to tackle ice at all. They’re big, tough and strong, and can generally handle almost anything you throw their way. If you’re facing chunks of ice within snow, you’re very much in luck. This is one of the easiest situations you can encounter because all you have to do is run your gas-powered dual stage snow blower over the ground, and let the augers break up the ice chunks. The middle scenario is an ice ridge somewhere along your driveway. Depending on how big and tall it is, your snow blower may or may not be able to break it up. If you’re having any difficulties, use a shovel to whack the ice ridge into a couple of large chunks and then run your snow blower over it to break it up. However, if you’re unlucky enough to be dealing with a sheet of ice — like if you drove a car over an unshoveled drive multiple times — you’re probably not going to be able to get rid of the ice. Think of how layers of ice form over the ground and what your snow blower can do: a snow blower is designed to run over the ground, pick up loose-ish material and blow it away. 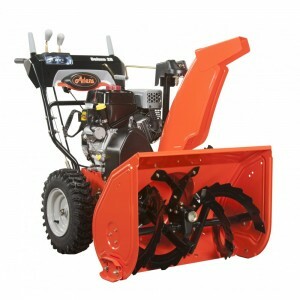 And if the snow has been tamped down to turn into ice, then your snow blower will have a really tough time in distinguishing between ice and solid ground. Snow Blower Source has the right machines you need to tackle almost every ice situation, so take a look at our selection for the snow blower that’ll best suit your needs and get free shipping on any one. But even if you pick out the biggest, baddest snow blower, make sure to get at your drive right away so you don’t need to add an ice pick to your snow-clearing arsenal.